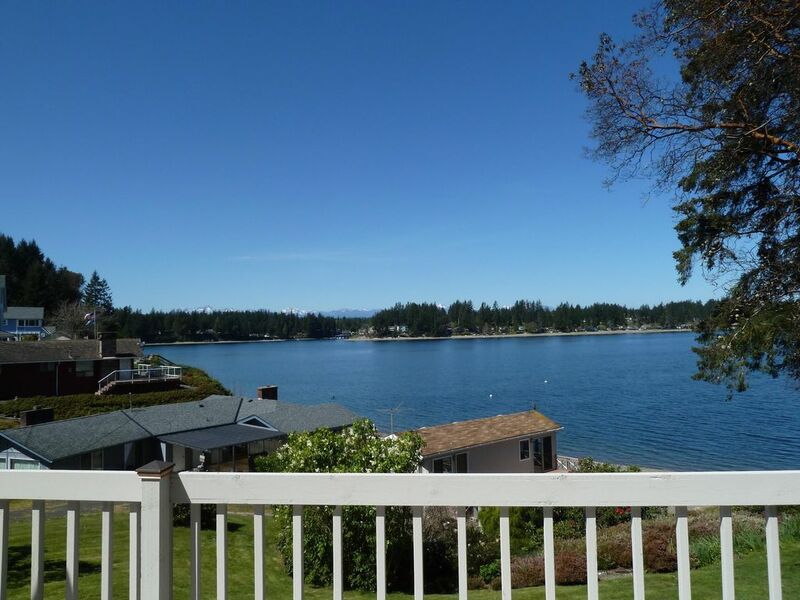 La isla de Belle House LLC, está ubicada en 800 East Eckert Road, WA 98546 Grapeview en 1. 25 acres de Puget Sound del Sur frente al mar refugio de tranquilidad y belleza. A 968 sq. Ft. 2 dormitorios 1 baño, casa rural situada en la isla de estiramiento, Grapeview, WA, en la entrada de casos. Situado junto a Stretch Marine Point State Park, con acceso a la playa fácil, y el sueño de un amante del kayak. Cubierta delantera grande al aire libre con barbacoa de gas, patio trasero al aire libre aislado, con un amplio aparcamiento en el lugar. Cocina completa incluye: lavavajillas, cafetera y molino, licuadora, microondas, tostadora, horno tostador, remodelado en 1985 por nuestra Gramma Pat en su gusto y estilo. cubierta al aire libre (frente) w / juego de mesa / paraguas, parrilla de barbacoa de gas, 2 tumbonas reclinables, vistas a la montaña más maravillosa estrella mirando. patio al aire libre aislada (espalda) w / mesa / paraguas fijado para 4. Wi-Fi de alta velocidad equipado con inteligente reproductor de Blu-Ray para el streaming (Netflix, etc) y 32 "pantalla de televisión (canales de aire de TV locales sólo - 4, 5, 7, 9, 11, 13 - no hay canales por cable). Ventana de ventilación de aire acondicionado (3) instalado en cada dormitorio y la zona común. Estiramiento de la isla es una zona maravillosa para estas actividades: kayak, caminatas por la playa, natación, canotaje, esquí acuático, montar en bicicleta, caminar, correr, observación de estrellas y relajante. Fácil acceso a la playa y vistas de Puget Sound / montaña olímpica completan el encanto único de la isla de La Belle House. Isla Stretch es una zona maravillosa para estas actividades: kayak, caminatas por la playa, natación, canotaje, esquí acuático, montar en bicicleta, caminar, trotar, la astronomía y relajante. Fácil acceso a la playa y vistas de Puget Sound / montaña olímpica completan el encanto único de la isla Belle House. The property overlooks the water. The house is lovely, clean and full of what you need to cook. (I always bring my own as you are never sure what is missing.) Well stocked with cookware and dishware. Next time I would bring our kayaks to move into the water. Lovely spot. We will return. We enjoyed a wonderful stay at "The Island Belle House". Older but very well maintained property with a beautiful location! We thoroughly enjoyed our stay! The water views and beach were terrific! The house is very well cared for and we appreciated all the nice things the owners have done to make their guests feel welcome. The deck has a nice Weber grill and nice patio furniture. The beds were comfortable and the house was very clean. Kayaking was wonderful and we had easy access to Fair Harbor Marina for our larger boat. The manager was very easy to work with. We will definitely return! Thank you! The location is great and very quiet. It is a nice house and well maintained. However, I would make more room to put clothes away during our stay. need for the task at hand. Other than that, we had a great time. Beautiful magical place with a stunning sunset and view of the Olympics. I would totally recommend this beach house for peace and quiet, then, if you want some things to do, there are plenty right there: kayaking, searching for star fish on the beach, swimming, fishing, bicycling around Stretch Island, walks and all this without a car! Yay!! We stayed at Kathy's home for 2 nights in June 2018 and had a wonderful visit. The home is positioned perfectly between downtown Seattle and Olympic National Park, which made it easy to get to the two places we were visiting during our trip. However, we could have spent more time just at the home itself, as it was very tranquil and our boys enjoyed splashing around and finding creatures in the water. Found a cute little ice cream shop and restaurant just a few miles away. We were lucky to have clear skies on our last day and see the mountains in the distance - stunning! The home itself reminded me of my grandmother's home, in a good way. Older furnishings and style, yet meticulously clean and comfortable. Best sleep we had on our trip by far! And by meticulously clean, I mean super meticulous!! Kathy was very responsive to emails and calls and made our stay easy and smooth. Would love to return at some point and spend more time there! Only recommendation I would have is to add a kayak or two to the home for guests to use. I would have loved to wake up each morning and kayak around in the water for some morning exercise. Situado en una isla pequeña, rural conectadas por un puente país, este escondite cuenta con campos, pantanos y algunos viñedos activos para establecer el escenario para este romántico lugar de alejarse, con fácil acceso a la playa de agua salada a un parque marino Estado. Vistas del agua y las montañas olímpicas son preciosas ... tranquilidad y la belleza se encuentra en abundancia. Tres opciones de golf cercanas son 10- 30 minutos - Lakeland Village (10 minutos) la montaña del oro y trofeo del lago. Para la navegación, Fair Harbor Marina está a sólo 1. 2 millas de distancia (visible desde la terraza) con un barco rampa de lanzamiento, de combustible y de almacenar. Su barco puede ser amarrado usando una de las boyas de amarre State Park Marina justo debajo de la casa. acceso a la costa desde un barco debe ser sólo ligera - no hay muelle - pero teniendo presente las mareas cambiantes. viñedos locales y la historia de uva jugo / vino completan este lugar por excelencia del sur de Puget Sound. ARRIVAL / DEPARTURE TIMES: Your arrival time must be pre-arranged with property manager. Late arrivals of 1 hour or more cannot be guaranteed entry. Departure time is 12:00 noon. Late departures must be pre-arranged with property manager, otherwise, a partial forfeiture of damage deposit will occur. $200 deposit to guarantee booking. Visa, check or cash accepted. Full deposit refunded on cancellations 30 days or more. 4 days cancellation in winter. During high season May through September to get your deposit back you MUST cancel at least 30 days prior to check in. Our property manager lives 3 doors away, and will assist with check-in and help with any issues or questions during your stay. Your ARRIVAL TIME MUST be pre-arranged with property manager.